Appearance: Pours a very deep dark mahogany with a thick, tan, two-finger head that receded quickly leaving good lacing. Smell: I picked up on breads, dark fruits, some winter spices (cinnamon, allspice, cloves) with a brown sugar and gingerbread cookie finish. Scents were all pretty subtle but combined to make an extremely enticing beer. Initial Taste: Nice. The initial taste doesn’t disappoint. There is a lot going on here. The smell would lead you to believe this might be a muted beer. Quite the contrary, this is a very flavorful ale. Lots of dark fruits (berries, raisins) followed up by brown sugar and sweet malts. Winter spices are also very apparent; cloves, cinnamon, nutmeg, allspice and even some ginger. Finishes clean with a soft hoppy bite. 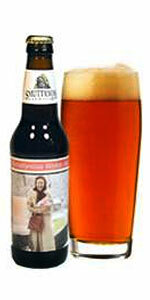 Thoughts: Smuttynose Winter Ale is a full-bodied, amber beer brewed with a special Trappist ale yeast. Making this beer more of a Belgian Abby Double than a winter warmer like you would expect. This is a nice change of pace from the other winter warmers and Christmas ales out there right now. Smuttynose made the right decision to break away from the usual and give us something unique. This beer is balanced very nicely between the sweetness of the malts and brown sugars and the winter spices and soft hops. Just like their fall seasonal (Smuttynose Pumpkin Ale) Smuttynose has done a very good job delivering a seasonal beer that anything but run-of-the-mill. Highly recommend. Delisiouso !! Everything the review said it was. Only comment was the color of the beer was not consistent. The color of the beer was the same color as the bottle…even in strong light.